Kool Karaoke offers a unique party experience for all ages. In the recently renovated bus, you and your family and friends can enjoy the ultimate karaoke experience with a computerised karaoke system offering over 10,000 songs (including the latest hits), a subwoofer, LED party lights and a TV monitor for karaoke or to display your photos or video. 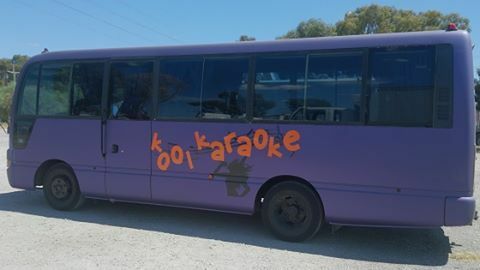 This is a great option for a birthday party, bucks/hens night, or special occasion and you can choose to enjoy karaoke on your way to or from your destination, or opt for a complete tour experience (with or without karaoke). Choose from Swan Valley tour options or explore a range of attractions in the Perth. You can customise the tours to suit the needs of your guests and with seating for up to 12 passengers, the comfortable bus is perfect for any type of gathering. Curtains and tinted windows are included for added privacy, so you and your group can party the night away. Kool Karaoke is also air-conditioned and has a wheelchair lift and restraints to safely transport those in need of a wheelchair accessible vehicle. Find out how you can celebrate your next special event aboard Kool Karaoke by visiting the official website and Facebook.